RealNetworks has been told by the courts that its DVD copying software RealDVD will continue to banned from sale. Although the court was adjourned back in May, it has taken a few months to decide whether RealDVD should be allowed on-sale. This ruling upholds the original injunction that was put into place while a lawsuit issued to the company by the MPAA was investigated. Judge Marilyn Patel decided that the injunction should remain, and will do so until a formal trial. The bad news for RealNetworks is that a trial isn't expected for at least a year. Unsurprisingly, MPAA chief Dan Glickman said the decision was a "rule of law". 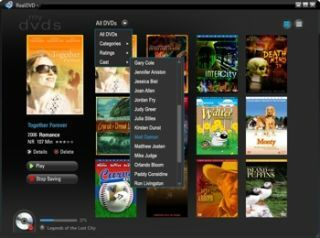 RealNetworks is currently working on another version of RealDVD, which allows users to archive their DVD collection. Called Facet, it is a hardware version of RealDVD which is Linux-based and has the capacity to hold around 70 DVDs digitally. It is not known whether the courts decision will keep this device from hitting shops, but it is likely that Facet will also be affected.